Meridian is a nurturing & rigorous school serving students at all academic & developmental levels. Our collaborative, child-centric school community celebrates student diversity & teaches foundational skills needed to succeed in an increasingly global world. Our Common Core-aligned curriculum encourages students to explore & develop their own talents while taking students outside classrooms to learn about their community, city, nation, and world. •Continuum of services for the whole-child supporting academic, behavioral, social/emotional growth. Links families to in-house & community resources. 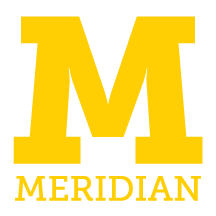 •Nearly 1 in 2 Meridian Middle School graduates are attending a selective magnet program or a Tier 1 charter high school. •Inclusive & integrated model for providing support to ELL & SPED students in each grade; won competitively awarded grant funds in 2018-19 for expansion.